This Brite Safety Style 5020 classic 3-season jacket. water and wind proof, is made with a tough woven polyester shell which is soft and supple. The polar fleece lining with full interliner and zip through collar will keep you warm on colder days. Our Style 5020 Jacket feature 3M Scotchlite Reflective Material. It can be zipped into our Style 5030 High Visibility Parka as an additional layer in extreme weather conditions. 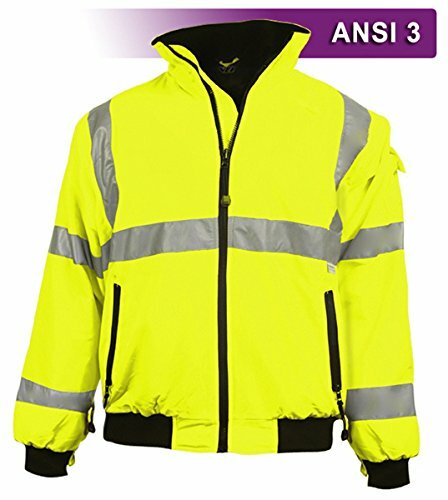 Our heavy duty jackets are ideal for highway road work, emergency responders, construction, transportation, utilities, surveying, landscaping, and manufacturing; and other outdoor activities such as hunting, motorcycling, fishing, jogging, cycling, sailing, hiking, and casual wear where high visibility and saftey is a priority. WATER-RESISTANT AND WINDPROOF. Woven Polyester Pongee with PU Coating, with polar fleece lining. FRONT ANGLED POCKETS WITH EXPOSED ZIPPER CLOSURE. Zippered fly front extends through collar, Mic Tab. FRONT ZIPPERED SLASH POCKETS, 1 SHOULDER CELL PHONE POCKET for gear and equipment storage. ANSI/ISEA 107 CLASS 3 COMPLIANT, available in Fluorescent Lime Yellow. If you have any questions about this product by Brite Safety, contact us by completing and submitting the form below. If you are looking for a specif part number, please include it with your message.